Many sports leagues have increased the amount of time and money they invest in marketing to their youngest demographic as they realize the immense buying power children wield. In addition to their own purchasing power, children heavily influence their parents’ buying decisions and will grow to become the adult consumers of the future, so teams use various forms of marketing to convert these people into fans while they are young and keep them fans for life. The data shows that 77% of children, over three out of every four, ages 7-11 said they considered themselves fans of the NBA. NFL and MLB each had impressive results with 69% of children considering themselves fans, while college basketball and action sports were right behind at 68%. Although MLS, college sports, NASCAR and the NHL were near the bottom of the list, they nevertheless showed impressive results as 62% of children were fans of MLS, 60% of college sports, 57% of NASCAR and 50% of the NHL. 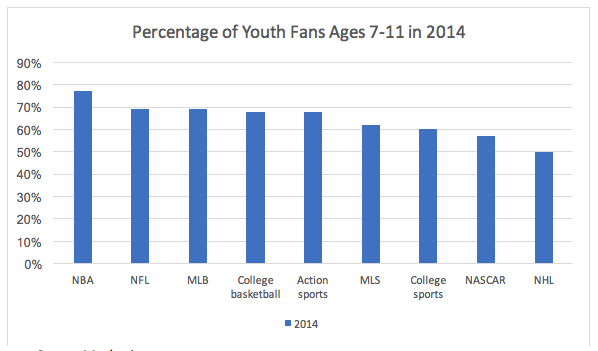 These statistics demonstrate exactly how large the demographic is for youth fans in sports. As such, leagues have taken notice and spent billions over the last few years on concentrated marketing efforts targeted directly to children. “We’ve been laser-focused for the last five years trying to connect kids to the NFL,” said former NFL Vice President of Fan Strategy and Marketing Peter O’Reilly (@ploreilly). With the safety concerns of football garnering more attention in recent years and parents pulling their young children out of the sport, the NFL has developed specific marketing materials that focus on drawing kids back into the game and reassuring their parents that the sport is safe. According to marketers, the NFL uses a 360° strategy of synthesizing television, gaming, online and mobile marketing, and in-person events to fully immerse kids in the NFL brand. The NFL uses a multi-media approach that allows them to access the NFL at any time on any platform. “Because children and youth are heavy media users and early adopters of newer technologies, media marketing and advertising campaigns using both television and newer media are efficient pathways into children’s homes and lives,” said Dr. Sandra L. Calvert, chair and professor of the department of psychology at Georgetown University. The league also integrates itself into children’s lives by partnering with government agencies, local schools, non-government organizations, industry trade associations and corporations like Nickelodeon and McDonald’s. These partnerships aim to promote healthy eating habits, exercise and elementary education while simultaneously disseminating the NFL’s brand to children. Just as the NFL developed websites and content geared specifically toward children, the NBA launched the Hoop Troop in association with Cartoon Network in 2011. This interactive youth platform, aimed at creating lifelong NBA fans and increasing consumption among children ages 6 to 12, included digital and programming aspects, as well a multifaceted digital, print and television campaign. By registering an account on the NBA Hoop Troop website, kids are eligible to earn points both online, by watching videos and playing games, and offline, by attending NBA games and events or playing basketball. The points can be redeemed to create a virtual, customizable “NBA Amazing Arena,” an immersive environment populated with games and elements that further entice kids to the NBA brand. Similarly, Major League Baseball markets to children by devoting a section of each team’s website specifically to their youngest demographic. Teams also encourage kids to register for their kids club programs that include perks like team gear, baseball cards and access to special ticket promotions. While the short-term goal of these programs is to boost attendance and increase revenue sales, the long-term goal is to help create lifelong fans who will support the team for years to come. By offering special promotions and giveaways to entice fans when they are young, sports marketers are instilling a love of the team in these kids that will only grow as they continue to grow. As evidenced by the data and marketing efforts of these sports leagues, certain ways of marketing sports to children can be very effective and have a lifelong impact. With the rise of digital media and a growing number of communication channels, it is easier than ever for sports marketers to reach kids and introduce them to the brands that will become their teams for life. Baseball Popularity Declines Among Kids, So MLB Teams Offer Free Tickets, Kids Clubs | Money. (n.d.). Retrieved from http://time.com/money/3768009/baseball-popular-kids-sports/. Calvert, Sandra L. (2008). Children as Consumers: Advertising and Marketing. The Future of Children, 18(1), pp. 205-234. Miller, R. K., & Washington, K. (2014). CHAPTER 11: SPORTS FANS. Sports Marketing, 65-74. NBA launches multiplatform marketing campaign for kids. (2016, March 18). Retrieved from http://pr.nba.com/nba-hoop-troop/.